I have been dating a guy, we have very strong feelings for each other. He recently broke up with me saying that he is beyond messed up, he cannot get close to anyone and when he starts to he gets feelings of fear, guilt and sadness. He has finally agreed to start counselling. He has been having a problem getting erections. He had been married before we met and I think this stems from what happened with their marriage, she cheated on him... He ended the email saying that he wanted to stay in contact with me and that he thinks about me when he jerks off. So I guess my question is if he can think about me and get aroused, why when I am in front of him can he not? Also, a part of me is wondering if he is just trying to get rid of me. But then I think that he wouldn't have been so honest in the email to me, he didn't have to spill his guts that way right? It sounds to me like he's really terrified of intimacy. Maybe this was an issue in his marriage too - the fear of being too emotionally close - and maybe that's what led to his wife looking outside the relationship for that connection. If he can get aroused thinking about you, but can't get an erection when he's with you, I'm sure it has everything to do with his fear, as well as the feelings of guilt and sadness that he's identified. Emotions are usually the cause of erectile issues. Counseling is an great idea for him. Meridian Tapping/EFT would be another excellent way for him to overcome these issues. A 96-Page guide to lead you out of the darkness of depression and into the light of your own True Self. 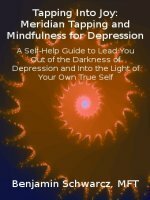 Learn to use Meridian Tapping/EFT for your own self-healing from Depression, Anxiety, Trauma and Stress. Step by Step instructions from the basics to the subtle art of getting powerful results quickly, even with complex issues.